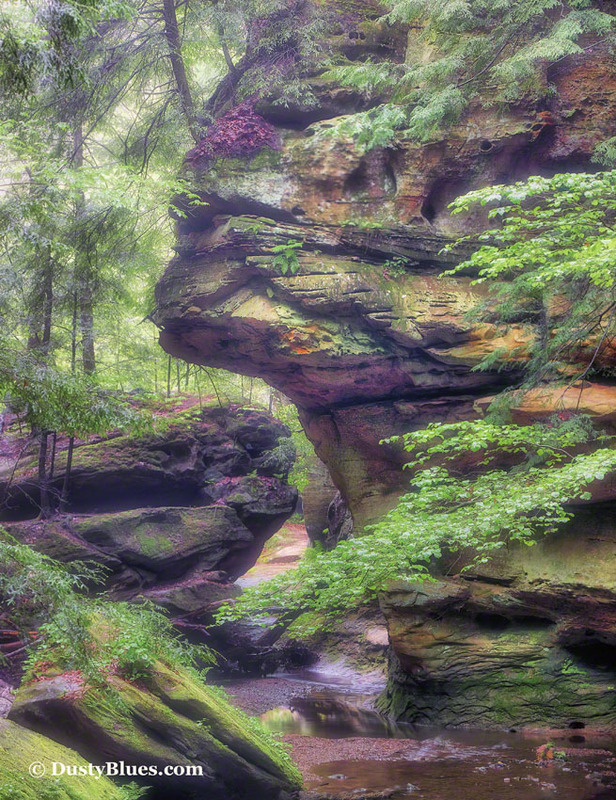 The Old Man’s Cave area of the Hocking Hills State Park is one of the best places to witness amazing geology. Great towering cliffs and numerous waterfalls, the gorge is laden with many hardwoods and huge Hemlock trees. It also has the most facilities available anywhere in the park. A new visitors center is currently under construction and scheduled for a June 2019 opening. Many visitors begin their hike at the head of the Grandma Gatewood trail near the main parking area. You begin the hike by crossing a beautiful old stone bridge and then deciding whether to hike the rim of the gorge or to descend into the gorge itself. The Grandma Gatewood trail follows the inner Old Man’s Cave gorge for 1 mile and then proceeds to the Cedar Falls area and eventually to Ash Cave for a total of 5.5 miles, one way. Grandma was an international legend from this area and is widely known for through-hiking the Appalachian Trail several times in the 1950’s while in her 60’s. Should you descend at the Upper Falls area your hike will take you through a 3/4 mile of beauty as the Blackhand Sandstone that makes up the walls of the gorge follow the Old Man’s Creek as it flows from the Upper Falls and makes it’s way to the Lower Falls section. Along the way their are many outstanding features such as the Devil’s Bathtub, The Sphinx and the cavernous overhang known as the Old Man’s Cave where an old hermit, Richard Roe, lived and hunted for many seasons. Legend has it that one winter, while trying to break the ice to get water, he used his muzzle loader and it went off accidentally and shot and killed him. Several days later some trappers found him and buried him under the ledge but no one has ever found his remains. Occasionally hikers report hearing his hunting dogs howling for their master. Those hikers who choose to remain on the rim trail can follow this trail among the Hemlocks and find many places allowing one to peer into the gorge. Part way along the gorge rim trail a wonderful A-Frame bridge allows passage back to the opposite gorge rim and a return path back to the visitor’s center and the main parking lot. There are several ways to descend into the gorge allowing the hiker their choice of shorter or longer hikes. Along the way there are many bridges, tunnels and stairs that were built in the 1930’s by the Works Progress Administration (WPA). These have aged beautifully and blend with the natural scenery in an exceptional way. The park service adds and replaces bridges and designs the new ones with a natural aesthetic in mind. These seem to compliment the older structures and together give the visitor an enjoyable experience. Whichever path you choose to follow the stunning natural scenery provides a wonderful hike. Through thousands of years of erosion mainly within the softer middle layer of the Blackhand Sandstone, the gorge has been carved out. Much of the erosion is due to glaciation from the last major glacier, the Wisconsin, between 14,000 and 17,000 years ago which halted just before reaching the Hocking Hills State parks. As they began to recede the outflow from the thaw and an adjoining considerable ice lake cascaded the area with millions of gallons of silt and rock laden flow. The middle layer of the Blackhand Sandstone is a very porous material and quite susceptible to erosion while the upper and bottom layer are more fused together and resistant to the abrasive forces. This confluence gave rise to the geologic wonders we behold here today. 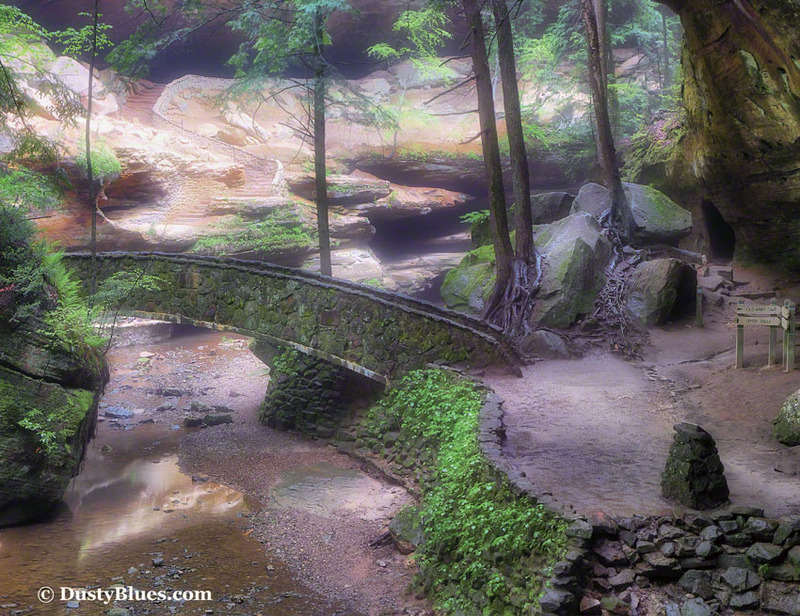 In 1924 the State of Ohio bought 146 acres here in the Hocking Hills which included the Old Man’s Cave tract. Initially operated by Ohio’s Division of Forestry, it eventually came under the purvey of the Ohio Department of Natural Resources and the Ohio Division of Parks began direct control of Old Man’s Cave. Their contemporary management bodes well for today and future generations of appreciative visitors. 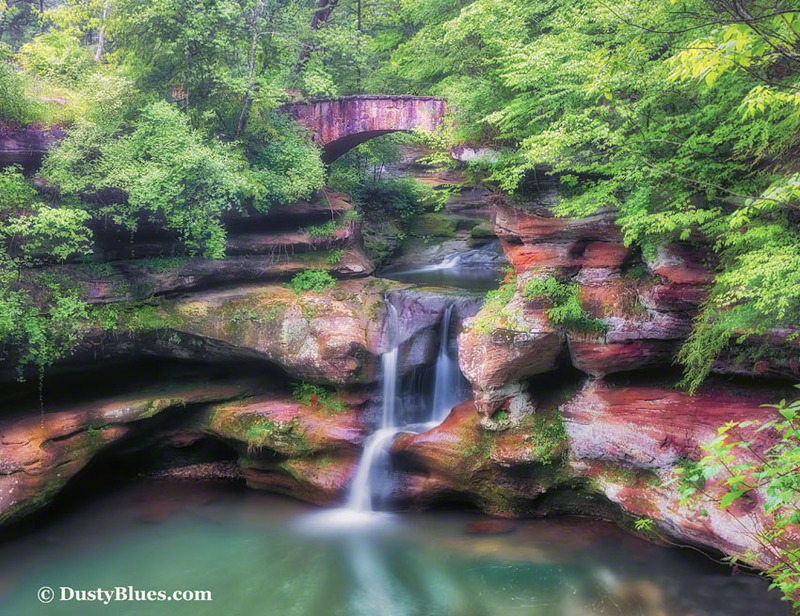 This entry was posted in Fine Art, Hocking Hills on March 14, 2019 by Dusty Blues.